"Beef cubes and bar-b-que beans combine quickly in this hearty and tasty slow cooked meal. No need to brown the meat makes this extra easy for the working mom. Great with cornbread or brown bread and a cold beer." 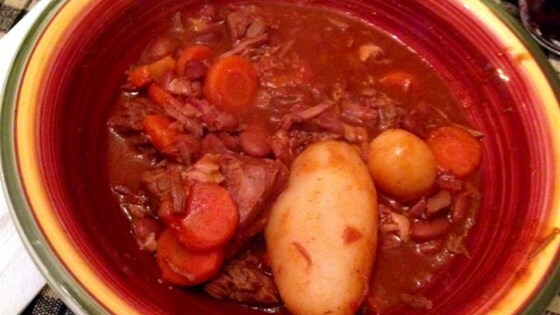 Place the beef stew meat, sausage, onion, and potatoes into a slow cooker, and stir to distribute evenly. Spoon the baked beans evenly over the mixture. Cover, and cook on Low for 8 to 10 hours, or cook on High for 4 to 5 hours. I wasn't a fan of this one. It was definitely hearty, but it lacked pizazz and flavor. You can try livening it up by adding spices and green peppers, but I haven't even touched the leftovers!